Each one of us, in every area of our life, is in some kind of a flow. If this flow continued, it will lead us to a certain future. But is this future acceptable? What if one could create a life, an organization or a team of design, rather than that of drift, by getting skilled in creating a future of choice ? This book provides a simple 6-step framework to actively create a future of one’s choice. While this book is titled Declaring Breakdowns, it is about mastering the art and science of generating breakthroughs in each area of our lives. 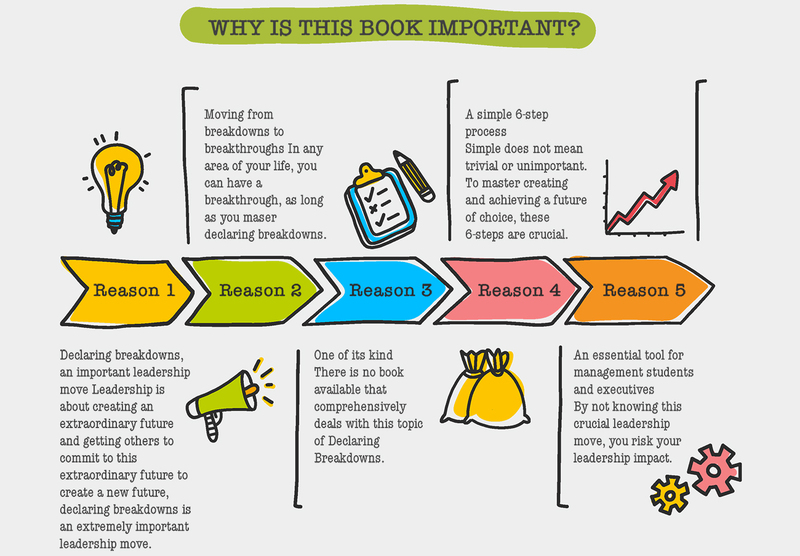 This is a simple 6-step process that has already led many individuals and organizations to breakthrough performances. It has helped teams resolve their issues and work with commitment towards what they care about. 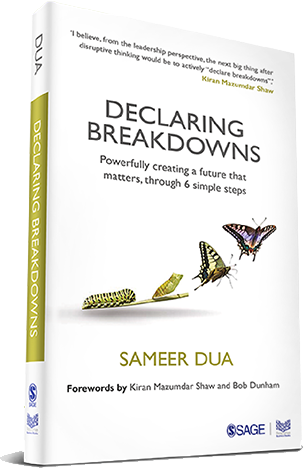 Declaring breakdowns is a conversational move for leaders and is an effective way of creating breakthroughs every day. Whether it is a breakdown in your car while going to office or a snag that is encountered or envisioned in the merger of two organizations, this technology is helpful in coping with change and effectively dealing with the situation in hand. To declare a breakdown is to take a stand. It is a declaration that you will take whatever action is needed to achieve any future that you may create. When you declare a breakdown, you declare that you want to exercise choice in matters of your life. Declaring a breakdown is declaring that you are taking responsibility in a particular matter of your life. And finally, you declare your own breakdown. Nobody can declare it for you. The next step is to bring your attention to focus on ‘what is so’. You do so by getting present to the assertions in the matter. Assertions are claims of facts that can either be true or false. When you are looking at ‘what is so’, you look at an action that either happened or did not happen. You look at the situation objectively to establish facts that are observable or measurable or those that can be evidenced. Most importantly, when you are looking at ‘what is so’, there are no stories, no justifications, no explanations or no reasons. There are only facts (assertions). What is observable in the world as a fact is not an opinion. Step 3: If No New Action Is Taken, What Is the Default Future in This Area? The answer to this question identifies where you will end up if no new action is taken. Each one of us has a default future in different areas of our life. Most of us are blind to our default future. Some others choose to be observers who want to lift the veil of transparency from their default future. The ones who do so may choose to take action to change this default future. Once you have distinguished the default future and have created a new future, the missing actions may become apparent to you. These are the missing actions from ‘what is so today’ to ‘where I want to be’. These missing actions are generative conversational moves/conversational actions. All of the above is meaningless if you do not execute on your commitments to fill in the gap between ‘what is so today’ and the ‘new future’. At the end of the day, it is only actions that give you results. You must get skilled in order to take actions yourself, and also in calling on your network of help to coordinate actions with others so that the new future/shared future is achieved.